with Agnew's, London, from whom purchased by the present owner, 1978. London, Royal Academy, Masters of British Watercolour: The J. Leslie Wright Collection, 1949, no. 270. Watercolours of Irish subjects by Paul Sandby are rare, only a few drawings are known, though there are thirty Irish views engraved in Sandby's One Hundred and Fifty Select Views ..., 1781. It is unlikely that Sandby himself travelled to Ireland, as a visit would surely be referred to in his correspondance. 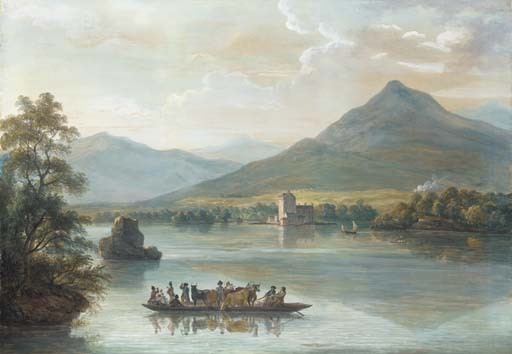 It was a common practice at this date to work up drawings from other artists' sketches and there are three works in the possession of the Hamilton Art Gallery, Australia by Paul Sandby, including another view of Ross Castle, which appear to be based on sketches by the amateur Irish artist Lord Portarlington (John Dawson), who was an habituáe of Sandby's house when he was in London. (see A. Crookshank and the Knight of Glin, The Watercolours of Ireland, London, 1994, p. 45). Ulster Bank is delighted to be involved with this new partnership with Christie's in Ireland. Supporting the visual arts is an important objective for Ulster Bank and bringing the Irish Sale Preview to Belfast and Dublin is an exciting development. We are particularly pleased that the Belfast Preview will be held in the prestigious surroundings of our Group Head Office in Donegall Square East. Ulster Bank is one of the leading financial institutions in Ireland and is part of The Royal Bank of Scotland Group, which is the second largest banking group in Europe and fifth largest in the world. Our operating philosophy places excellence at the core of everything we do and ensures that our customers have access to the best service available. We know Christie's is also synonymous with excellence in the buying and selling of art and so, we believe, Christie's is a natural partner for Ulster Bank. I am sure everyone who visits the Sale Preview in Belfast or Dublin will find it a stimulating, enjoyable and rewarding experience. On behalf of Ulster Bank I look forward to welcoming our guests to both events.